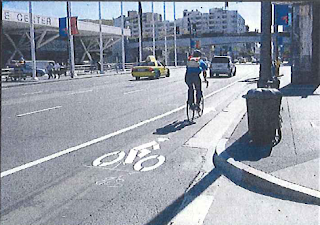 SF Taxi Media: SFMTA Officially Says Taxis Can Pick Up And Drop Off In Bike Lanes! By John Han. SFMTA Officially Says Taxis Can Pick Up And Drop Off In Bike Lanes! By John Han. It's been more than a year in the making. The San Francisco Municipal Transportation Agency (SFMTA) will be issuing bumper stickers to all of the City's taxicabs, indicating that taxis may legally pick up and drop off public riders in bike lanes, and should not be ticketed. 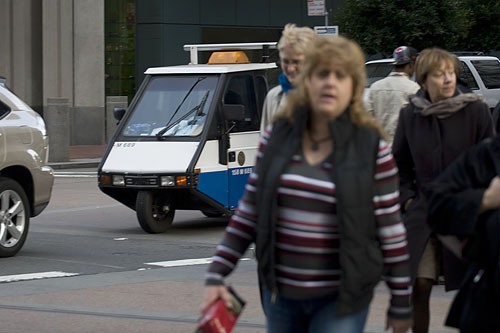 The agency put out a memo dated October 18, 2011 instructing all of San Francisco's taxi companies to notify their drivers about the plan. 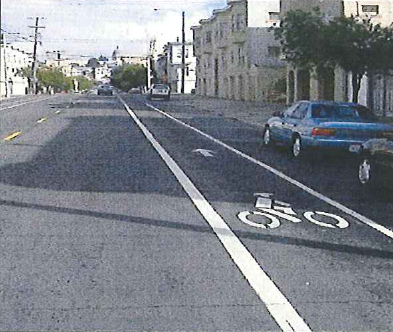 The memo, signed by Deputy Director of Taxis Services Christiane Hayashi, says not only will the SFMTA issue the bumper stickers, but it has also issued "guidance" to the Parking Control Officers (PCO's) instructing them not to ticket taxi drivers who are actively loading or unloading in bike lanes. In 2010, taxis (mainly day drivers) were grossly targeted by the PCO's along main boulevards such as the Embarcadero (in front of the Ferry Building) and along downtown areas of Market St. Both of those boulevards have bike lanes, with Market St. having what is known as a "separated" lane. Unusually high volumes of $90 and $100 tickets were being issued by the PCO's last year when cab drivers would pull into bike lanes long enough to either load or unload passengers. Most of these tickets were mailed in to the cab companies, meaning that the drivers did not know they had been ticketed. A month or so later, a company cashier would hand them the envelopes with the high priced tickets inside. Cab companies said that the mail in tickets posed an administrative problem. And while drivers considered those tickets to be unfair, many were unsuccessful in getting them dismissed and wound up paying them. For separated bike lanes, taxis may only enter for disabled and elderly riders. The MTA's taxi/bike lane memo contains detailed instructions for drivers on how to properly use bike lanes to pick up and drop off. Cab companies are required to post the instructions on their properties until June 30, 2012. To view the instructions online, CLICK HERE. Here are examples of non-separated bike lanes. 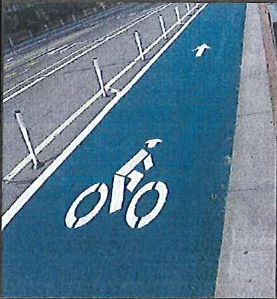 Here is an example of a separated bike lane. Hooray!!! Finally, the common sense prevailed! Now, only if my fellow cab drivers can pull over to a corner and not AT the stop sign to do their whole cash/credit card transaction. Hooray, more obstructions for cyclists to worry about! This makes no sense: why should the *convenience* of taxi drivers and their passengers trump the *safety* of cyclists? I get it for disabled or elderly (which are a very small number of total drop-offs/pick-ups), but for everybody else, their convenience of not having to walk at most half a block doesn't trump basic safety for cyclists. The city is sending mixed messages here: they want to encourage cycling, but then they want to continue allow conditions (motorists blocking bike lanes) that make cycling dangerous. Cars parked in bike lanes are a MAJOR SAFETY ISSUE for bicyclists. It forces them to swerve in and out of bike and car lanes, making their path unpredictable. It also makes drivers RAGE when bikes ride in the car lanes, even when the bike lane is clearly blocked. If taxis are going to double park somewhere, why not just stop in the car lane and block other cars? hey jr195 .. maybe because the bike lane is closer to the sidewalk where the little old lady is trying to get to ... and the thinking is that you on your patsy bike wont run her over before she gets to the sidewalk.